Here Caleigh is at 4 months and 5 days old. Her liver numbers were beyond high at this point. I believe her bili was 13. She was such a sick baby. Her skin was yellow, her eyes were yellow. I loved the outfit in this photo, but everyone told me it made her skin look so bad. Well, yeah, it was bad. Mustard green on a yellow baby is definitely a fashion fopa. I love this photo though. It's one of the few pictures that I have from the NICU that actually has Caleigh looking into the camera. At this time, Caleigh was having complex partial seizures. We didn't know. So she was either crying, or sleeping. Same goes for my state of mind during that time. When this picture was taken, Caleigh hadn't smiled, or made so much as a coo. She was so incredibly sick that the day to day task was surviving and planning on the next step to save her life. 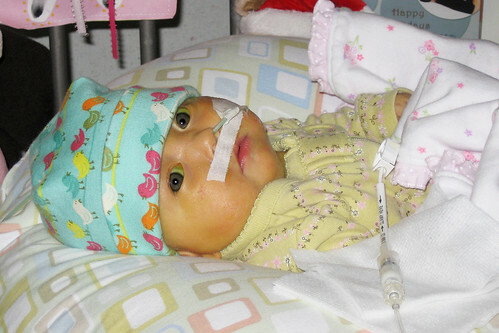 That's what our NICU journey was...a marathon to save Caleigh's life. A couple of things led me to post this photograph of Caleigh. One being that I bought a wonderful frame for our living room and I started going through old photos to pick out which ones I wanted in it. Another reason for going through the old photos is that I've been asked to speak to a group of incoming NICU nurses and give them my perspective from a parent point of view. Along with that, I'm also doing a story board of sorts to hang in the NICU with Caleigh's journey and some photos. Going back through the old photographs and thinking about our trek as a family of three has really stirred things up emotionally for me. From some of the first few days after Caleigh was born and seeing her belly button; imagining what her belly would look like now if she hadn't had 8 more surgeries. To looking back to each holiday that we missed out on. There's the photo of Santa visiting Caleigh while she was recovering from surgery. She was bloated, red and on an high frequency vent struggling to breathe. There are sweet pictures of Eric holding Caleigh and staring at her tiny face. Watching through the pictures the infamous "rollercoaster" that we were on every single day for 6 and a half months. In one photo Caleigh would look ok, wearing a cute outfit and snuggling on our chest and then the next photo would be her on a ventilator, no clothes, belly distended, red and hard. Looking back, took me back and quite honestly it's been hard.